We just released Firefox 65 with a number of new developer features that make it even easier for you to create, inspect and debug the web. We hope you’ll love using these tools just as much as we and our community loved creating them. The Firefox DevTools team is on a mission to help you master CSS layout. We want you to go from “trying things until they work” to really understanding how your browser lays out a page. Flexbox is a powerful way to organize and distribute elements on a page, in a flexible way. To achieve this, the layout engine of the browser does a lot of things under the hood. When everything works like a charm, you don’t have to worry about this. But when problems appear in your layout it may feel frustrating, and you may really need to understand why elements behave a certain way. That’s exactly what the Flexbox Inspector is focused on. First and foremost, the Flexbox Inspector highlights the elements that make up your flexbox layout: the container, lines and items. Being able to see where these start and end — and how far apart they are — will go a long way to helping you understand what’s going on. One way to toggle the highlighter for a flexbox container is by clicking its “flex” badge in the inspector. 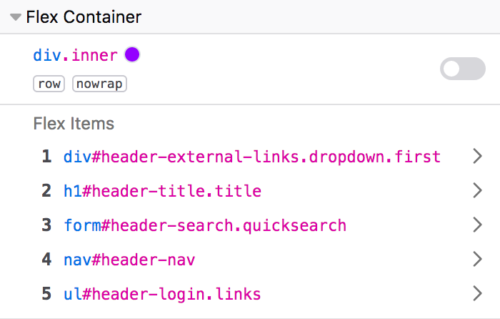 This is an easy way to find flex containers while you’re scanning elements in the DOM. Additionally, you can turn on the highlighter from the flex icon in the CSS rules panel, as well as from the toggle in the new Flexbox section of the layout sidebar. The beauty of Flexbox is that you can leave the browser in charge of making the right layout decisions for you. How much should an element stretch, or should an element wrap to a new line? But when you give up control, how do you know what the browser is actually doing? 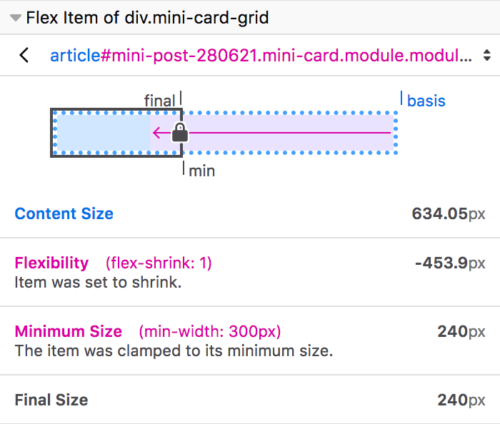 The Flexbox Inspector comes with functionality to show how the browser distributed the sizing for a given item. The layout sidebar now contains a Flex Container section that lists all the flex items, in addition to providing information about the container itself. Clicking any of these flex items opens the Flex Item section that displays exactly how the browser calculated the item size. The diagram at the top of the flexbox section shows a quick overview of the steps the browser took to give the item its size. It shows your item’s base size (either its minimum content size or its flex-basis size), the amount of flexible space that was added (flex-grow) or removed (flex-shrink) from it, and any minimum or maximum defined sizes that restricted the item from becoming any shorter or longer. If you are reading this on Firefox 65, you can take this for a spin right now! Open the Inspector on this page, and select the div.masthead.row element. Look for the Flex Container panel in the sidebar, and click on the 2 items to see how their sizes are computed by the browser. Let’s suppose you have fixed a flexbox bug thanks to the Flexbox Inspector. To do so, you’ve made a few edits to various CSS rules and elements. That’s when you’re usually faced with a problem we’ve all had: “What did I actually change to make it work?”. In Firefox 65, we’ve also introduced a new Changes panel to do just that. It keeps track of all the CSS changes you’ve made within the inspector, so you can keep working as you normally would. Once you’re happy, open the Changes tab and see everything you did. What’s next for layout tools? We’re really excited for you to try these two new features and let us know what you think. But there’s more in store. You’ve been telling us exactly what your biggest CSS challenges are, and we’ve been listening. We’re currently prototyping layout tools for debugging unwanted scrollbars, z-indexes that don’t work, and more tools like the Flexbox Inspector but for other types of layouts. Also, we’re going to make it even easier for you to extract your changes from the Changes panel. If you’re working with frameworks and build tools, then you’re used to seeing really long error stack traces in the Console. The new smarter stack traces identify 3rd party code (such as frameworks) and collapse it by default. This significantly reduces the information displayed in the Console and lets you focus on your code. The Collapsing feature works in the Console stack traces for errors and logs, and in the Debugger call stacks. If you are tired of smashing the arrow key to find that awesome one-liner you ran one hour ago in the console, then this is for you. Reverse search is a well known command-line feature that lets you quickly browse recent commands that match the entered string. To use it in the Console, press F9 on Windows/Linux or Ctrl+R on MacOS and start typing. You can then use Ctrl+R to move to the previous or Ctrl+S to the next result. Finally, hit return to confirm. Wherever objects can be inspected, in the Console or Debugger, you’ll see >> icons next to getters. Clicking these will execute the method and print the return value. Console logging is just one aspect of understanding application state. For complex issues, you need to pause state at precisely the right moment. Fetching data is usually one of those moments, and it is now made “pausable” with the new XHR/Fetch Breakpoint in the Debugger. Kudos to Firefox DevTools code contributor Anshul Malik for “casually” submitting the patch for this useful feature and for his ongoing contributions. There’s work in progress on much requested features like Column Breakpoints, Logpoints, Event and DOM Breakpoints. Building out the authoring experience in the Console, we are adding an multi-line editing mode (inspired by Firebug) and a more powerful autocomplete. Keep an eye out for those features in the latest release of Firefox Developer Edition. Zameer Haque: Improved contrast for resource status in the Console. Heng Yeow: Added the Referrer-Policy to the resource Headers list in the Network panel (and fixed other bugs). Adam Holm: Updated the design for the Edit & Resend dialog in the Network panel. Ariel Burone: Swapped the Domain and File column in the Network panel. Also, thanks to Patrick Brosset, Nicolas Chevobbe and the whole DevTools team & friends for helping put together this article. As always, we would love to hear your feedback on how we can improve DevTools and the browser. Download Firefox Developer Edition to get early access to upcoming tooling and platform. Martin is a Product Manager at Mozilla, working on Firefox DevTools. This is wonderful, might consider developing on Firefox now! Great to hear. Our goal is to make DevTools feel welcoming (yet powerful) for every user, independent from what their primary developer browser is or was. Please let us know via the community channels how this works for you, good or bad! So the old debugger frontend is gone along with usable breakpoints and value editing. Great job. We are working to fill in the feature gaps left from the rewrite. Breakpoint quality has been an issue we have been working on for a while (the old debugger was affected as well). Significant breakpoint quality improvements are coming together in 67 with column breakpoints and a new event breakpoints panel. We hope to have an update as soon as it hits developer edition in a few weeks! Firefox’s DevTools is good for me! I like it! Everyday i’m loving more the Firefox Dev edition. Regarding the debbuger. Is there any plans to allow editing the source code directly on the debugger? If the sources are local, of course. JS Editing is high on the list! While it is a hard problem we are getting closer setting the foundational work to starting the actual implementation; maybe this year (but no promises). Your use case of local source editing makes probably the most sense; the other tangent is integrating it with Track Changes. Overwhelmed by these impressive improvements I have just made a donation…. Multi-line editing does sound nice; i just hope that doesn’t mean you’ll be phasing out Scratchpad! We will phase out Scratchpad, as it would need a complete rewrite to otherwise remain a viable feature. Research showed that must users wanted the multi-line editing mode; which is why we carry this feature over before removing Scratchpad. I’d be interested to hear, what is your main use case that Scratchpad solves?